Date of publication: 29 May 2012 . In this article we would like to open our new section where we will publish various "adaptations" IKEA. And we start with all the famous rice paper lampshade called Regola. What is he like? Metal frame in the shape of a ball, covered with translucent rice paper. Passing through rice paper, the light is soft, not cutting the eye. Generally, IKEA many similar shades - it VÄTE, PRI, Orgel and many others. IKEA designers like to use this material in their products, because it is cheap, aesthetic, and it can be given a variety of the most bizarre forms. Through the use of rice paper in the shade and huge numbers of its value at IKEA is about 10 $, which opens up great opportunities for creativity. So, we proceed to the actual decor of our lampshade. 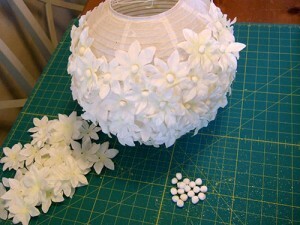 That, in what will become a Chinese lantern Regola in the figure below. What was it - you can see link. Natural color, shape and size can be any decor - it depends on your goals and preferences. 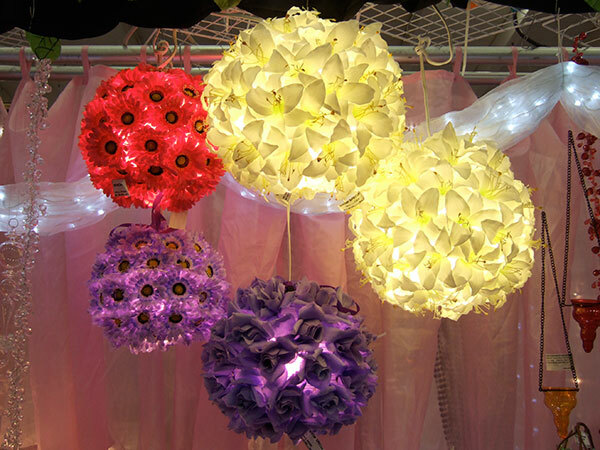 If you bought a garland of flowers, it is likely there will be plastic parts, from which you will need to get rid of. 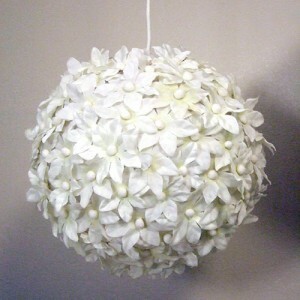 Instead, in the middle of a flower glue pom-poms from the fringe to give the flowers a finished look. The last thing on the stick to get the color shade, try not to leave space uniformly filling the entire surface of the lampshade. That's all. 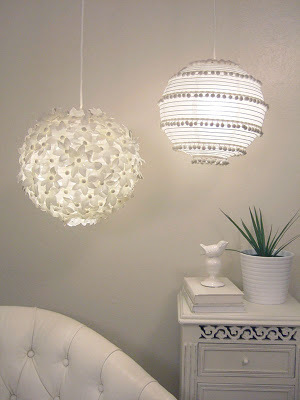 Below - a couple more options decor lamps made of rice paper. Excellent! I really liked it!!! Excellent! I really liked it!!!! ! !